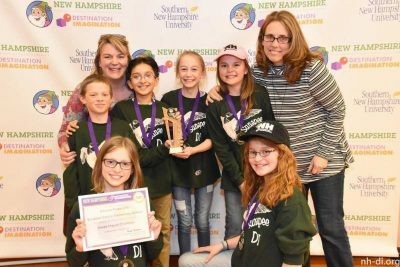 Both Sunapee teams competing in the statewide Destination Imagination competition have won first place! Project Sunapee is matching donations to support them as they advance to the Global competition in Knoxville, Tennessee! They will compete along with 8,000 contestants from around the world in late May. After months of hard work, building creativity, collaboration and problem-solving skills, on Saturday, April 5 NH Destination Imagination teams competed in science, technology, engineering, arts, math, and service learning-based challenges at the New Hampshire Destination Imagination State Finals at Bedford, NH. 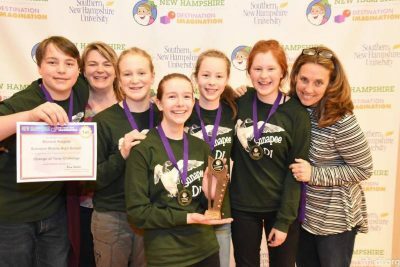 Two Sunapee teams, one at the middle school level and one at the elementary school level, won first place for their challenge in their division. In May they will travel to the world’s largest celebration and competition of creativity, Destination Imagination Global Finals at the University of Tennessee. Nearly 300 New Hampshire academic teams started forming in the fall, with competitions starting last month. In all, over 1,800 Granite States students participate and over 150,000 students in 48 states and countries as well. Top scoring teams from each challenge and age level will meet to compete at Global Finals in May. In all, the 39 New Hampshire teams will be among 8,000 competitors at the Global event held at the University of Tennessee in Knoxville. The SMHS team is not new to the Globals scene. This will be their 5th trip. On two occasions they placed 7th, and most recently they placed 2nd – in the world. This year they are competing in the Fine Arts division. This will be the first trip for the SCES team. They are competing in the service learning category. For their project they carried out activities for Sunapee’s senior citizens. Please consider rewarding them for their amazing efforts with a donation.